Uganda is an exciting and safe destination and is called the "Pearl of Africa". Drive from Kampala to Murchison Falls National Park with Game viewing en-route (if arriving from Nairobi should be in Kampala the previous night). Arrive at Nile camp for lunch . Time allowing, have an evening game viewing drive. In the morning have a trip through the Victoria Nile to the foot of Murchison Falls. In the afternoon you will have game viewing drive through to the top of the falls. Dinner and overnight at Nile Camp. After breakfast drive back to Kampala either lunch enroute or in Kampala. Drive from Kampala (equipped with Gorilla permit) and onto Bwindi National Park and will have lunch at Mbarara. Continue to Buhoma Gorilla Camp for dinner and overnight. Start (with your guide) tracking these relatives of humans in the forest. The animals are not hostile but while intimidated they could be dangerous. Return to Buhoma Gorilla camp. All meals at the camp. 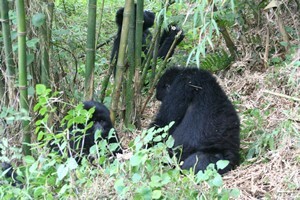 Second day of tracking the Gorillas (though optional) and returning to Buhoma Gorilla Camp for the overnight. After breakfast drive back to Kampala with lunch on the way and arriving in Kampala in time for dinner.